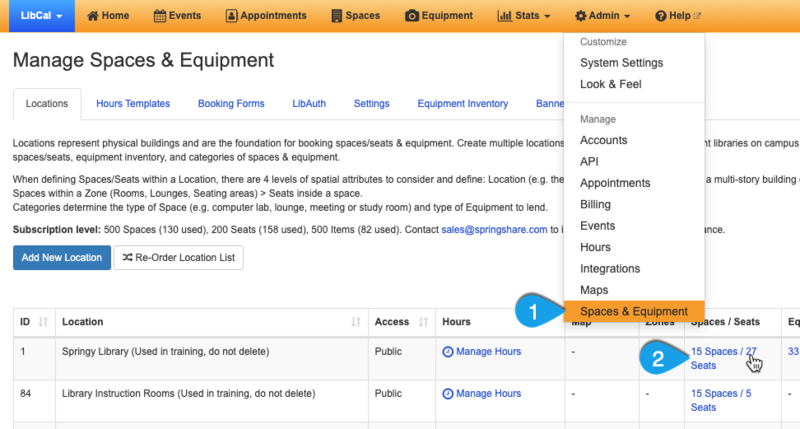 To add and manage a location's spaces, go to Admin > Equipment & Spaces and click on the link in the Spaces column for your location. Spaces are the physical, bookable rooms that belong to your category. 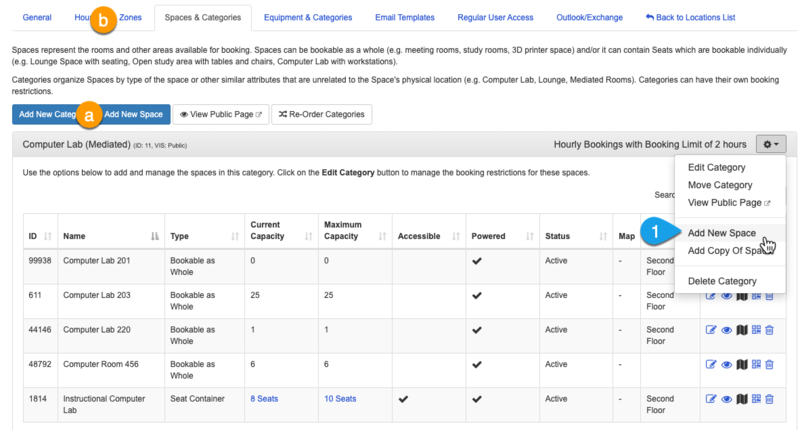 So, if you have a category called "Study Rooms", you would need to add an item for each individual study room that's available for booking. Click on the Add New Space button for the category where you want to add the space. Verify that the correct Category for this space is selected. Once a space has been created, you cannot change its category later. Click the Save button. 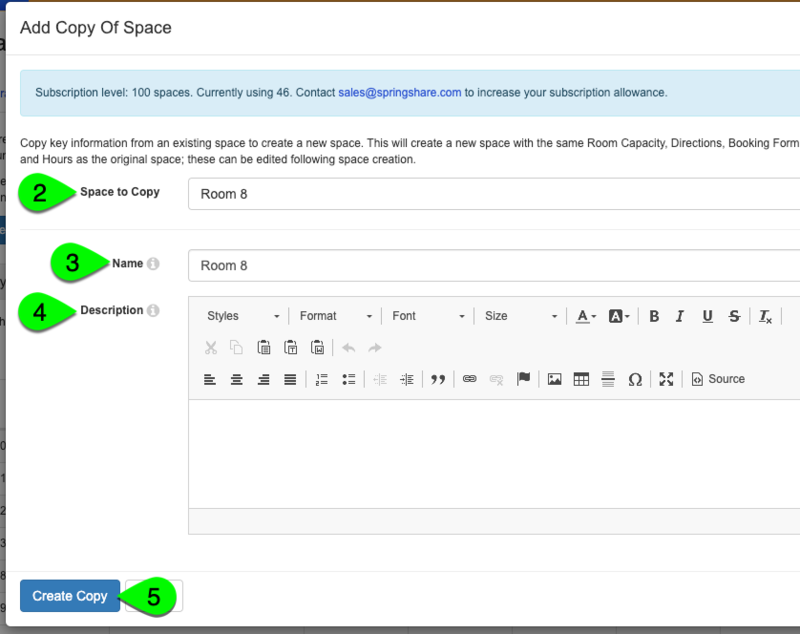 This will take you to the Edit Space page so you can configure the details for your new room. See the next sections for information about each option. Pro tip: Do you have flexible spaces that can be divided? If you have a space that can be divided, such that each part can be booked separately or all parts can be booked together, simply create one space for each part of the room. For example, if you have a room that can be divided in half, create one space for Half A and another space for Half B. If a user only wants to book Half A, they can do that while leaving Half B available (or vice versa). If Half A and Half B are both available at the needed times, then the user simply needs to add both spaces to their booking request. If either Half A or Half B is in use at the time they need, the availability grid on the public booking page will indicate this -- allowing them to see the next available times where both halves are available to be booked together. If you have several very similar spaces, each with the same capacity, description, etc., you can save time by copying one of the existing spaces. For example, let's say you have group study spaces, all with the same capacity, furnishings, terms & conditions, etc. Instead of having to re-enter the same information for each space, you can just add one and then create multiple copies of it. Click on the dropdown portion of the Add New Space button. Select Add Copy of Space from the dropdown. 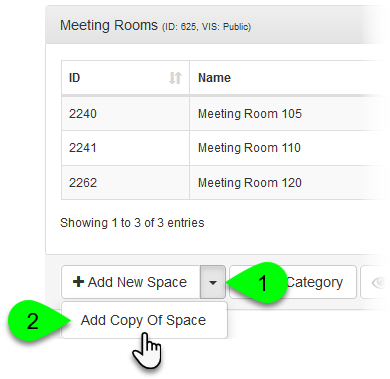 Select the space you want to copy from the Space to Copy dropdown. If desired, you can customize the name of the new space. You can also modify the description, as well. Click the Create Copy button. Name: this is the name of your space. Location: this is the location where you space belongs. Once you create a space, the location cannot be changed. Category: this is the category where your space belongs. Once you create a space, the category cannot be changed. Parent Space: if you selected "Yes" for Is Child/Partial Space, select the parent space to which this child/partial space belongs. Friendly URL: if you have added a friendly URL to your category's booking page, you can also create one just for this space. This will allow you to easily link directly to the public booking page showing only the information and availability times for this space. Each URL must be unique and can contain only letters, numbers, hyphens, and underscores. Friendly URLs are case sensitive, so we recommend using lowercase letters for best results. The slug that you enter here will be appended after the slug for your space category. Room Capacity: this allows you to indicate the maximum capacity for this space. This will appear on the public space booking page. Room Directions: this allows you to provide directions for helping patrons locate the space. This will appear on the public space booking page when someone views additional information about the room. Booking Form: if you have a custom booking form you'd like to use for this space you can select it here. The questions from the selected form will be combined with those of your location and category's booking forms. 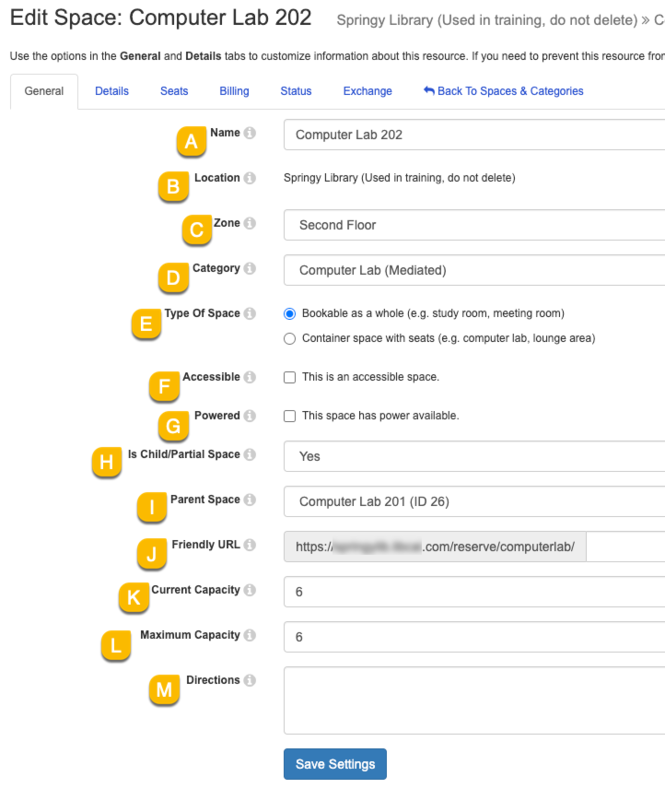 LibAuth Group Rule: if you have enabled LibAuth in your location's settings and your authentication method supports group permissions (such as CAS or SAML), you can select a group permission to apply to this space. For example, this could be used to restrict bookings for this space to faculty and staff. Image URL: this allows you to upload and display an image of the space, which will display on the public space bookings page when someone views more information about the space. 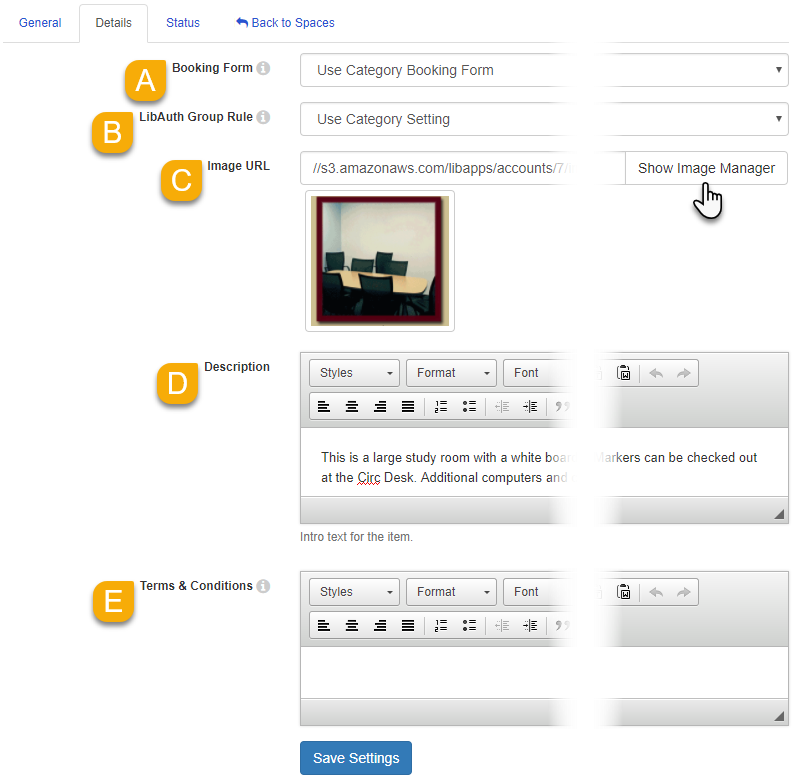 Click on the Show Image Manager button to upload or select an image from your Image Manager library. Note: the recommended dimensions are 150px by 150px so that the images display optimally in the space allotted. Description: this allows you to provide a description of the room, such as any technologies or other amenities available. This will display on the public space bookings page when someone views more information about the space. Terms & Conditions: if this space has its own terms & conditions which are different from your location or category's, you can add them here. When you add terms & conditions to a category, they will be displayed in addition to your location and category's terms & conditions. Status: this allows you to set the room's availability. Active: this means the room will appear as available to the public and is able to be booked. Inactive: this means the room will not appear as available to the public and is unable to be booked. Lost/Broken: this is the same as Inactive, but can help you keep track of specific spaces that may be inactive due to disrepair. Click on the Edit () icon to edit a space's settings. Click on the Move () icon to move the space to a different category. Click on the Delete () icon to delete a space. NOTE: this will delete all bookings and stats related to this space.